Summary One of the occupants of this dwelling is disabled and wheelchair bound, so it was critical that every aspect of this design catered to the requirements of the disabled user. It was important that design also created a homely environment that did not feel overly clinical. The heating is underfloor and the dwelling is orientated on the site maximise the benefit of sun and light. Kildorerry - Old Butchers shop turned into a contemporary kitchen dining space - Renovation & Extension by CBA Architects Cork This retired butcher’s shop, in Kildorerry, North Cork, had character and its owners knew it too. When they went about looking for an Architect they found CBA Architects as their best fit, from an article written in the Cork Examiner about a previously designed house by the Cork Architects. The brief here was to design a space for the family, retain the character of the shop front and create a connection between inside and out with the garden to the rear. A winter garden was introduced internally, behind the shop front, not only to act as a winter garden but also as buffer to sound from the adjoining street, and to help retain heat in the main Kitchen/living quarters. House Extension - CBA Architects Cork This is an extension designed to take advantage of the southerly and westerly sun and to get light into the main living areas of the house, transforming this typical 1950’s semi-detached house in suburban Cork into a cool contemporary living space. The owners of this dwelling approached CBA Architects based on seeing some of our work around Cork and on seeing an article in the Irish Examiner on a dwelling designed for a client in Tipperary. The clients asked CBA Architects to re-design their existing Cork based home, to transform it both inside and out and to include an extension to incorporate an open plan living space for the family. A key feature in the open plan kitchen/living dining area is the sunken living space giving it a true sense of definition within the overall space. Other key features in this dwelling are the kitchen design and its finish, along with the bespoke open thread staircase with glass balustrade and polished stainless steel handrail, which is a standout element in the entrance hall and sets the tone for what’s to come in this Cork suburban home. CBA Architecture will provide a service to meet your needs. We offer a flexible commercial design, house design service and all our house planning, commercial planning applications include 3D images at no extra cost. For more information, contact CBA Architecture. 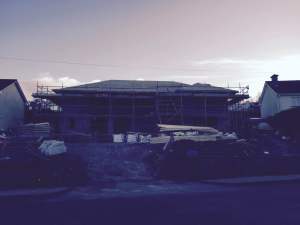 Construction has reached roof level on new dwelling at Norwood, Rochestown Road, Cork. Here's a 3D model/visualisations of the architects design to give you an idea of what it will look like on completion. Glandore: House Extension and Renovation This existing bungalow required a makeover and complete re-design of the internal spaces and layout. With the help of a small 6.5 sq.m extension we opened the living, kitchen and dining spaces, flooded them with light and took advantage of the views of the beautiful harbour at Glandore. At the other end of the house we converted a garage to include for a master bedroom with an en-suite. Windows and insulation were upgraded along with a new gas fired central heating system being installed. Key features in this design were a large island connecting the old with the new, A walnut sliding pocket door to allow for flexibility in the open plan spaces and standing seam zinc cladding to new extension externally. So, you have decided to start a new project and you are looking the right architect? CBA Architects have put together the following tips for you. Building a new home, extending your existing house or creating a new commercial site is an exciting process and finding the right architect is crucial to the success of your project. Finding the ideal architect is not difficult and this blog post will guide you through the most important points to consider when searching for an architect.